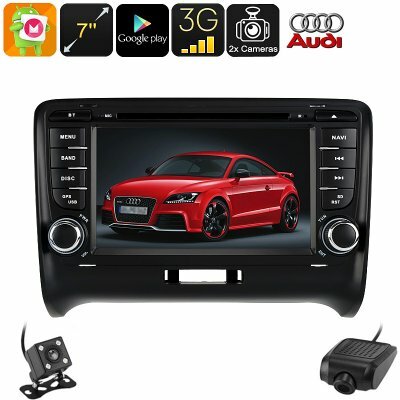 Successfully Added 2 DIN Car DVD Player Audi TT - Android 6.0, Car DVR, Rear View Camera, GPS, 7 Inch HD, 3G Support, WiFi, Google Play, Octa-Core to your Shopping Cart. This 2 DIN car stereo for your Audi TT (Model 1997-2004) features a highly accurate 20-channel GPS navigation system. With this car navigator at your side, you can be guaranteed that you’ll never get lost again. This car accessory will keep you up to date about local traffic situations and always shows you the fastest route to your upcoming destination. Your GPS works on Android maps so you can simply insert the needed map via the SD card slot. Once in place, you’ll be treated to detailed 3D maps on the 7-Inch HD display of this 2-DIN car media player. What really sets this Dual-DIN car stereo apart is the fact that it features an Android 6.0 operating system. Thanks to this, you’ll be able to entertain your passengers with Apps, music, videos and even games. From now on, you can be guaranteed that the people who drive along in your car will never feel bored again. With access to the Play Store, this car media player offers hours’ worth of free entertainment for anybody to enjoy. Additionally, it also comes with a regular DVD disc player. Therefore you’ll always be able to slide in a DVD and entertain your kids with their favorite movies during your upcoming summer holidays. With its Octa-Core CPU and 2GB RAM, this Dual-DIN car DVD player is sure to handle all the media files out there. This 2 DIN car stereo comes equipped with two cameras’ that include an FHD car DVR and a rear view parking camera. These car accessories are sure to improve your driving experiences as well as your safety on the road. As of today, you’ll always be able to record that what’s happening around your car. Additionally, you’ll be able to park your car in reverse effortlessly as your rear view parking cam will constantly show you what’s going on behind your vehicle. This 2 DIN Car Stereo comes with a 12 months warranty, brought to you by the leader in electronic devices as well as wholesale car DVD players.. This model is compatible with most brands of GPS software - however hardware specific software such as Garmin may not run on this unit. As the wholesaler, we provide the GPS-enabled hardware only, not the software. We provide no warranty or customer support regarding GPS software. We cannot provide downloads, links, advice regarding GPS software. Any software installation you undertake should be performed or supervised by a professional. To ensure your safety, the driver shall not watch TV or video or operate the player while driving for it may distract the driver from driving. Arabic: - استريو السيارة 2DIN - Chinese Simplified: - 2din 位汽车音响 - Czech: - 2DIN Autorádia - Danish: - 2DIN bilstereo - Dutch: - 2DIN autoradio - French: - Autoradio 2DIN - German: - 2DIN Autoradio - Hebrew: - מערכת 2DIN - Hindi: - 2DIN कार स्टीरियो - Italian: - Autoradio 2DIN - Japanese: - 2 din のカーステレオ - Korean: - 2DIN 카 스테레오 - Malay: - Stereo kereta 2DIN - Norwegian Bokmål: - 2DIN bil stereoplaten - Romanian: - 2DIN Car Stereo - Russian: - 2DIN стерео - Spanish: - Autorradio 2DIN - Thai: - เสียงติดรถยนต์ 2DIN - Turkish: - 2DIN araba Stereo - Vietnamese: - Âm thanh nổi xe hơi 2DIN.